Comfort-grip keeps the band firmly on your arm during workouting and running, It can securely hold your device in place. The face cover is made of a clear scratch resistant material enabling touch compatibility during your activities without sacrificing touch screen sensitivity. Headphone and charger cutouts allow direct access to the phone through the armband.Hidden jack design, without sacrificing perfect outlook. Built-in Key holder and Card Slot which allows for safe storage of ID, credit card and cash. Custom Design: Breath window improves air permeability of the thin armband. The small part at the end of the band prevents your device from dropping when disassembled. Special strip stops your earphone cable getting tangled. Special Features: Built-in key pocket stores your house key while exercising. Rear pocket is for storing ID, Credit Card, and Cash. The armband with design of a reflective strip at peripheral transparent screen is as a safety reminder when you are running or other sport activities. Premium Materials: Made of breathable lycra to provide soft, odor-free and lightweight wearing experience.The HD transparent PVC makes it easy to get access to the phone, manage the playlist or activate your stopwatch. Arm Girth Size: The adjustable band supports a wide range of arm girth from 20cm to 40cm and it is come with additional 16cm extender. Adjustable strap protects and stabilizes device without slipping or constricting. Multiple Size Options: "Galaxy S8/S9" size is perfect fit for Samsung Galaxy S8/S9 (5.8"), iPhone 6/6S/7/8(4.7"), , and Compatible with Galaxy S6/S7; "Galaxy S8+/S9+" size is perfect fit for Samsung Galaxy S8 Plus/S9 Plus (6.2"), iPhone X(5.8"). 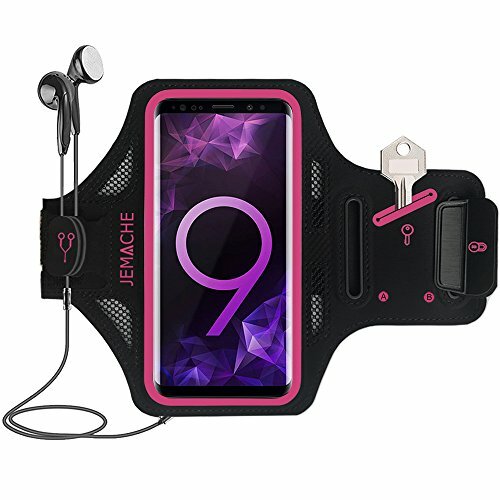 Note: The armband is designed only for the smartphone, and it is not compatible the device with a bulky protective case. If you have any questions about this product by JEMACHE, contact us by completing and submitting the form below. If you are looking for a specif part number, please include it with your message.